The last episode of The Office brought in big ratings for NBC last night. The series finale marked the sitcom’s best performance in a year and a half. From 9-10:15 p.m. ET, the series finale of “The Office” (3.0/8 in 18-49, 5.7 million viewers overall) filed the show’s highest 18-49 rating in 16 months, since the January 19, 2012 telecast also did a 3.0, and matched the “Office” high since November 3, 2011 (3.2). In total viewers, the 5.7 million is also the show’s biggest overall audience since January 19, 2012 (6.020 million). For the 9-10 p.m. ET hour, the “Office” finale ranked #1 among ABC, CBS, NBC and Fox in adults 18-34 and men 18-34 and tied with “Idol” for #1 in men 18-49. From 8-9 p.m. 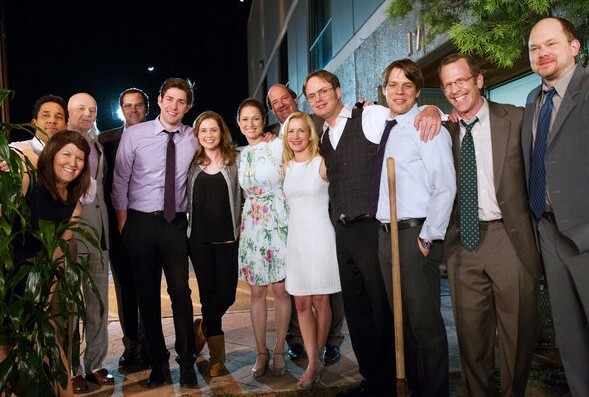 ET, a retrospective episode of “The Office” (2.1/7 in 18-49, 4.4 million viewers overall) earned NBC’s top 18-49 rating in the hour, excluding sports, since a special “Voice” ran in the time period on November 8, 2012. In total viewers, it’s NBC’s biggest overall audience in the hour since January 31. In a highly competitive time period versus season finales of CBS’s “Big Bang Theory” and Fox’s “American Idol,” the “Office” retrospective tied “Idol” for #2 in the hour among ABC, CBS, NBC and Fox in adults 18-34 (2.2 rating each from 8-9) and topped “Idol” in men 18-34 (2.0 vs. 1.7). From 10:15-11 p.m. ET, “Hannibal” averaged a 1.1/3 in 18-49 and 2.5 million viewers overall, matching the show’s 18-49 rating of the prior two weeks and equaling its highest since April 18. “Hannibal” is a highly time-shifted series, with last week’s telecast growing by 66 percent going from these next-day “live plus same day” ratings (1.06) to “live plus three day” results (1.76). What do you think? Did you watch the last episode of The Office? Did you think more people would watch?